Great Memories at Fresno Pride 15! Gay Tulare would like to thank everyone who participated in Fresno Pride this year! We had an amazing time, and it would not have been possible without your support! The 25th Annual Central Valley & Fresno's GLBT Pride Parade and Festival will take place on SATURDAY, June 6th 2015 in the Tower District between 10am and 3pm. Contact Gay Tulare to get involved in our booth and raffle contest! Gay Tulare will have a booth at Fresno Pride 2015! The parade/festival takes place in the Tower District, and you are all invited to join the fun. Gay Tulare is looking for volunteers to help out at the booth! Message us on Facebook for more details. 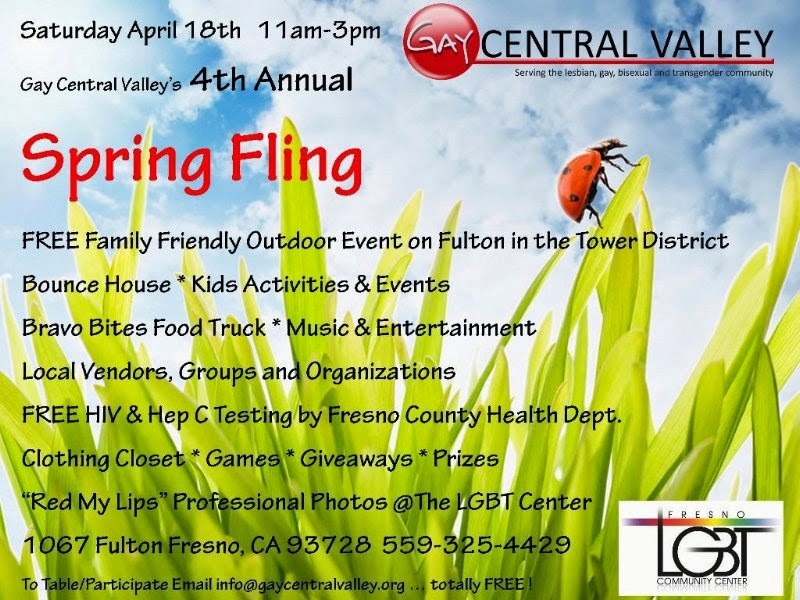 Fun, friends and food at Fresno LGBT Community Center, 1067 N Fulton St. Saturday, April 18th, 11am - 3pm!